p> What a difference two percentage points can make. A new provision of the sweeping Dodd Frank act that’s scheduled to take effect this January drops the allowable debt to income ratio for mortgages and other kinds of consumer loans from 45 percent to 43 – a small change with the power to make a big impact on the nation’s recovery from the recent recession. The Dodd Frank Wall Street Reform and Consumer Protection Act, as it’s formally known, was passed in July 2010 in response to the financial crisis of 2007- 2010. That crisis peaked in 2008 with the much-publicized housing collapse, as millions of homeowners were forced into foreclosure, in part because of predatory and unethical lending practices. 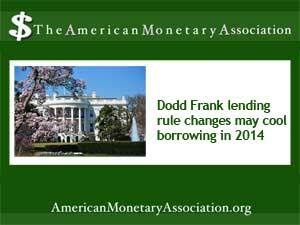 Some provisions of Dodd Frank are already in place, with more to come in 2014. For investors building wealth in income property as Jason Hartman advises, one of the most significant of these involves the Qualified Mortgage Rule’s debt to income ratio, or DTI. Though it pertains largely to mortgages, these tighter restrictions on qualifying for a loan also affect borrowers seeking funding for other kinds of purchases too. The DTI is a benchmark of determining a borrower’s ability to repay a loan. It’s calculated by dividing a borrower’s monthly debt repayments (including the potential new debt to be incurred) by monthly gross income. For first time homebuyers and those looking to refinance, though, the new rule, which goes into effect on January 10, lowers the allowable DTI from the 45 percent currently in place for traditional loans down to 43 percent. That may not sound like much. But financial experts say that those two percentage points can be the factor that stops many borrowers from qualifying. It’s expected to hit first time homebuyers the hardest and that could have the long term effect of chilling the housing recovery that fuels other sectors of the economy. The new standards go into effect just as the Federal Reserve has announced its plan to taper down Quantitative Easing, the economic stimulus program designed to jump-start the economy by pushing interest rates down. Those rates, already beginning to rise from the historic lows of the last year or so, are expected to increase as the stimulus tapers down – adding another roadblock for first time homebuyers.